On my SoSpa breaks I like to use all of the environment and one of the fun but challenging beach workouts are with the Kayak’s. 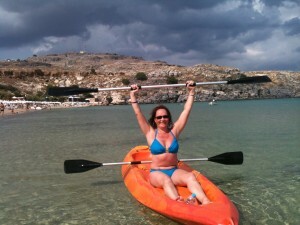 The Back,Chest,Stomach,shoulders and arms are used through kayak fitness training. When you are paddling expect to do about 500 maybe more, maybe less strokes per mile. Placing the paddle in the water and executing a good stroke is going to incorporate the muscles in the upper body and some is great for the abs too. In about one hour you are going to do about 1500 reps of low impact upper body movement. You feel well strong and toned after! I only use the kayak on my fitness breaks but it is a great hobby and skills can be perfected to attend more challenging expeditions of days or weeks and like many other sports has a great social/group interaction in clubs. So if you want to spice up your workouts give it a go or the very least try it on your next holiday. I get my clients doing some cruising around the caves and interval training across the bay…rather amusing for the sunbathers ! !